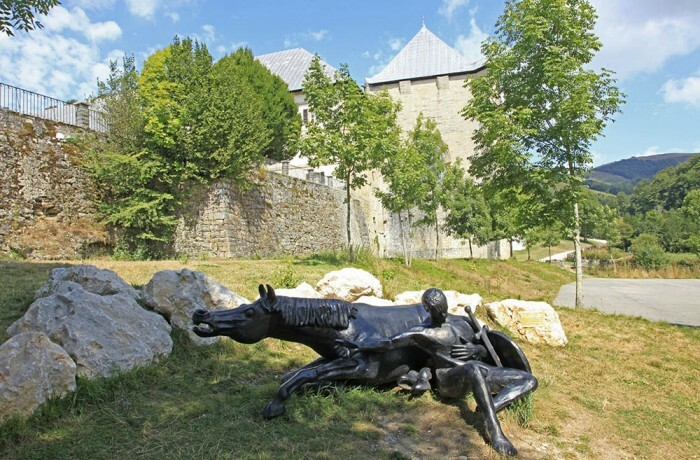 Roncesvalles is the first place that you will come to in Spain and has great historical significance for such a small village. It is situated at the bottom of the Pyrenees pass and is a very welcome sight for Pilgrims after the walk over the Mountains. The Village is situated on the small river Urrobi at an altitude of some 900 metres and is about 8 kilometres from the border with France. It has a hotel, Albergues, two bars but no shops. Roncesvalles is famous in history and legend for the defeat of the French Emperor Charlemagne and the death of his heroic knight Roland here in 778. Roland was a popular legendary figure in medieval Europe – The tale of Roland’s death is retold in the eleventh century poem The Song of Roland, where he is equipped with the olifant (a signalling horn) and an unbreakable sword- according to the stories he died during the battle of Roncevaux Pass, when Charlemagne’s rear guard was destroyed by Basque tribes.